The mainstream medical community has a new tool for fighting cancer, which they’ve dubbed the “fifth pillar” of cancer treatment. What they’re referring to is immunotherapy, or harnessing the power of a patient’s immune system to attack tumors. It’s hardly a new concept to those well-versed in the natural cancer-fighting ability of a well-cared-for body. Still, I applaud the flood of attention and money that’s now flowing in the direction of something we already know works. Ideally, by blending the time-tested concept of immune support with the new technologies, scientists will be able to bolster the immune system to attack cancer in ways we can’t even imagine. The new darling of biotechnology and immunotherapy is CAR T-cell treatment. Over the past year, plenty of praise has been heaped on this cancer “cure,” and it’s been plugged as a medical breakthrough thanks to profound success in battling certain malignancies such as brain tumors that, until now, had been nearly impossible to treat. This approach, which uses altered T-cells, has shown as much as an 80 percent response rate in people diagnosed with a blood cancer. More than half have even gone into remission. In addition, patients with extremely resistant tumors, who haven’t responded to conventional treatment, are showing unprecedented reactions to this therapy. As you may know, T-cells are the workhorses of your immune system. They prompt your body’s immune response and attack cells infected with disease. In CAR T-cell therapy, blood is first taken from a patient, then the T-cells are separated and removed. Using something called a “disarmed virus,” the T-cells become reprogrammed to produce receptors on their surface that enable them to recognize and attack cancer cells. These are called chimeric antigen receptors, otherwise known as CARs. After being reprogrammed, the CAR T-cells are infused back into the patient, usually following a chemotherapy regimen known as “lymphodepleting.” From there, the hope is that the engineered cells will multiply and spread, destroying the cancer cells they’re trained to “see.” It’s like developing your own personal vaccine against your strain of cancer. The point of adding the CARs is so the T-cells will seek out, recognize, and attach to specific cells. Sometimes the desired target is tumor cells, sometimes its protein or antigen cells, all depending on the patient and diagnosis. The whole process has been refined to the point where it takes less than seven days. This approach has seen profound effects on blood cancer, though not as much with cancers that involve solid tumors, in which the majority of tumor antigens reside inside tumor cells and are hard to access. Researchers hope this CAR T-cell treatment will be a turning point in some of the major, hard-to-treat, tumor-heavy forms of cancer, such as brain cancer, breast cancer, and lung cancer. CAR T-cell treatment is far from perfect. There have been deaths in some of the clinical trials, and side effects for those getting treatment range from high fevers and radical drops in blood pressure to a massive die off of B-cells, which produce the antibodies that fight infections in your body. Swelling in the brain is another potential side effect, as is seizure-like activity and confusion. Despite these challenges, Big Pharma – with Novartis leading the pack – has already poured billions of dollars into CAR T-cell research, with huge profit expectations. Just one round of the therapy, as priced by Novartis, is roughly $475,000. Now, obviously this isn’t something you can do at home, since you can’t alter your own T-cells and set up an IV drip line that sends them straight into a tumor. But what this science underscores is the far-reaching importance of your immune system, which has been grossly discounted in medical literature and cancer therapies in general. Only recently are large numbers of scientists beginning to take a serious look at using your immune system to help you – even though alternative-therapy physicians have been doing this for years, including training the patient’s own immune cells to recognize his strain of cancer. You can read all about it in our book The Amish Cancer Secret. Just know that despite the enthusiasm of the mainstream world, T-cells are not a “living drug” – though that’s how they’re sometimes described by pharmaceutical companies intent on winning a patent and selling these therapies. 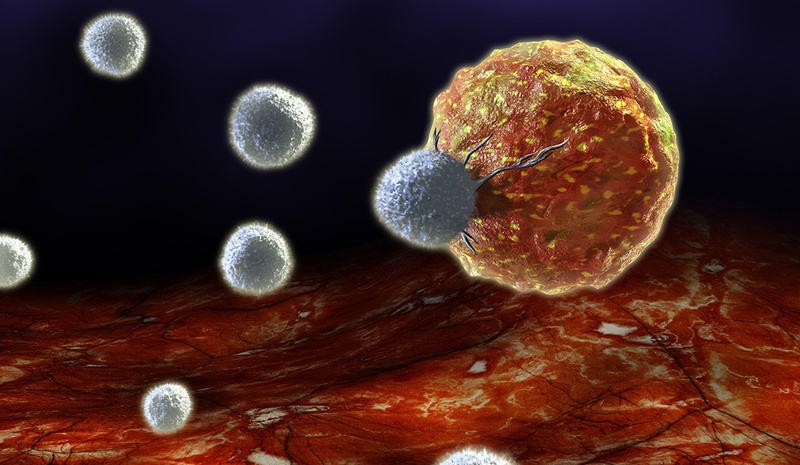 T-cells are already available to you, and they already attack cancer cells. So in lieu of spending $475,000 for this new-fangled treatment, you can use natural methods to boost the cancer-killing ability of your own T-cells. 1. Get lots of vitamin D. Think of it as the fuel that keeps your T-cells going. In fact, a study from the journal Natureshowed you can amp up your T-cell responsiveness by 750 percent, simply by getting enough vitamin D.
The best way to load up on vitamin D is through direct sunshine; just exercise reasonable caution to avoid getting a burn. You can supplement with between 3,000 and 5,000 IU of D3 daily – a smart tactic if you live in a region where it’s cloudy or cold a large part of the year. 2. Get enough selenium. Selenium increases the effectiveness of your T-cells, and you don’t even need a lot to kick them into action. A mere 200 mcg a day is a good target. The best natural sources are eggs, fish, mushrooms, and Brazil nuts. 3. Try taking Cat’s Claw. This is a supplement made from the South American plant, Uncaria tomentosa. Cat’s claw has been shown to activate T-cells and assist with keeping cancer contained. The best source is supplement form, aiming for 350 mg per day. Other natural ways to boost the immune system include eating more beta carotene and upping your levels of vitamins E and C. Boost your levels of glutathione, a powerful antioxidant your own body makes (our sister company, Green Valley Natural Solutions, can help with a supplement called Vital Force.) I’m also a great fan of mushroom remedies such as reishi, agaricu blazei, and coriolus versicolor. These remedies are perhaps not as powerful as culturing T-cells in the lab to kill a specific cancer strain, but heed these tips and maybe you’ll save our collapsing medical system $475,000. I do know of cases – many cases – where the natural methods were all a patient needed. And like all-natural healing modalities, best results come when you combine the supplements with exercise, plenty of sleep, low stress levels, and a healthy diet. Meanwhile, if you want to beat cancer, another good tip is to follow T.S. Eliot’s advice and “Eat a peach.” To find out why, scroll down and read the article below.